The Dogs in Hannover Street has always been a restaurant that I have wanted to visit after many recommendations and glowing reports. Selling itself as a place for no frills or fuss, just a place for great value food and wine. I thought it would be an ideal place for an afternoon bite to eat and drink with friends. The restaurant has a very laid back feel. Split into two rooms, we were seated in the smaller room. 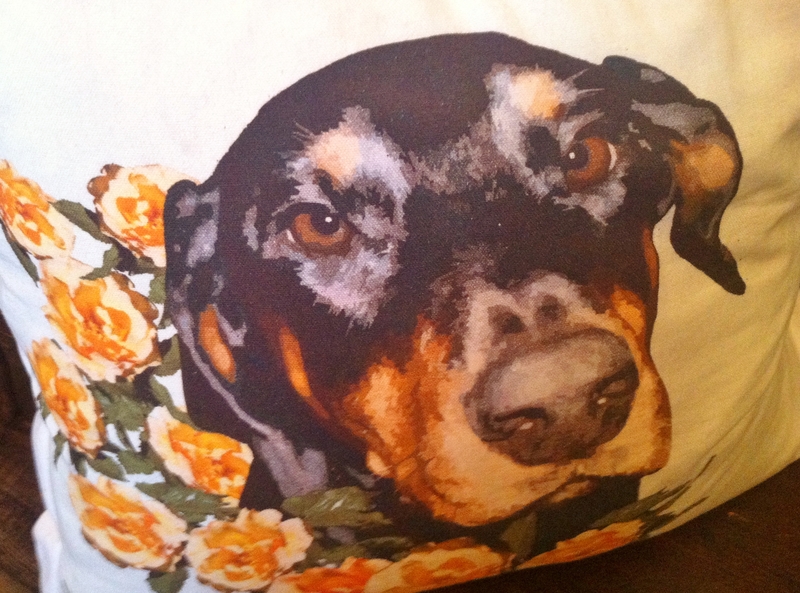 Pictures of dogs and cushions of dogs surrounded the area. There is a shabby chic theme throughout the restaurant with mis-matched tableware and cutlery. The lunch menu does not have starters therefore we ordered artisanal bread and butter for the table. Delicious warm soft bread with a crispy crust and soft melting butter. We looked forward to our mains. 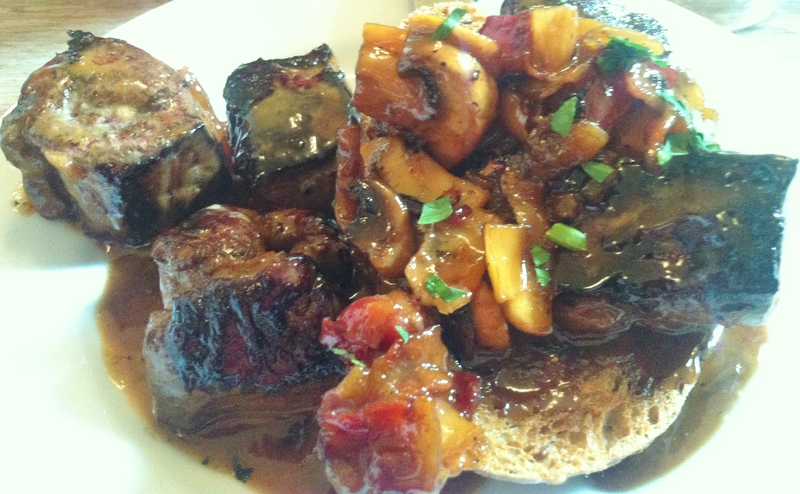 After a lot of consideration I ordered the devilled ox liver, onions, bacon and mushrooms on toast. The dish consisted of a crusty piece of thick bread piled with chunky tender soft juicy pieces of liver. A delicious sweet yet slightly spicy sauce, crispy bacon and juicy mushrooms gave this dish an overall very tasty flavour and texture. My friend chose the steak and mushroom pie. Again the meat was melt in your mouth, very tender and succulent. 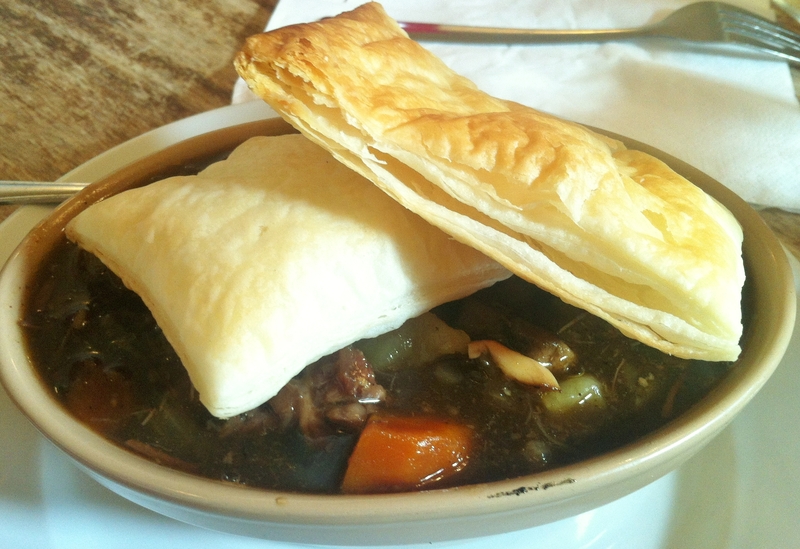 The pie had potatoes and vegetables within and on top two square pieces of crispy pastry. 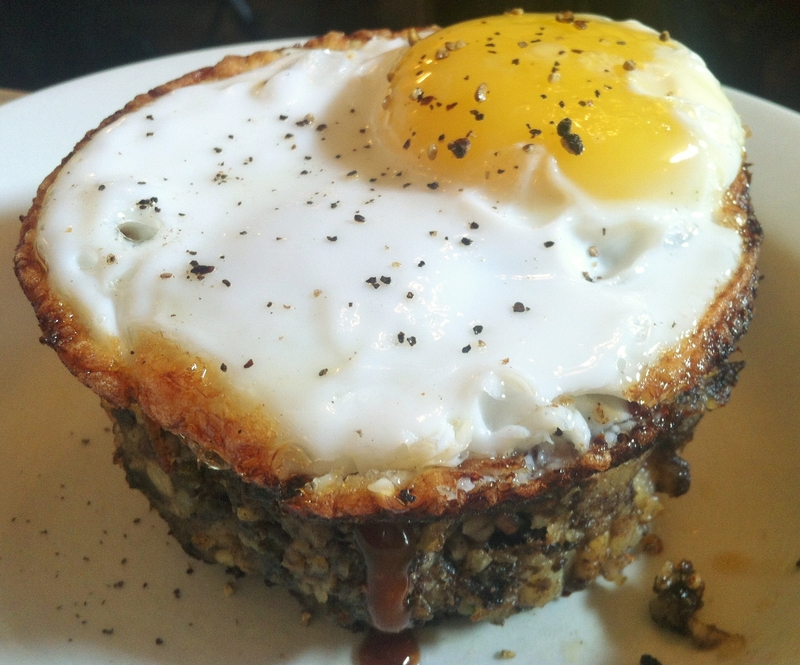 The other main chosen was haggis, black pudding and bacon hash with fried duck egg. This was probably the biggest of the somewhat small main meals. Haggis, black pudding and bacon mixed through potatoes and seasoned perfectly. The hash had a crispy outside with a soft centre. The duck egg was hard, which was a pity as a runny yolk would have brought this dish together. For dessert we decided to share two between us, chocolate brownie cake with ginger caramel and crème caramel. oth were such a disappointment. 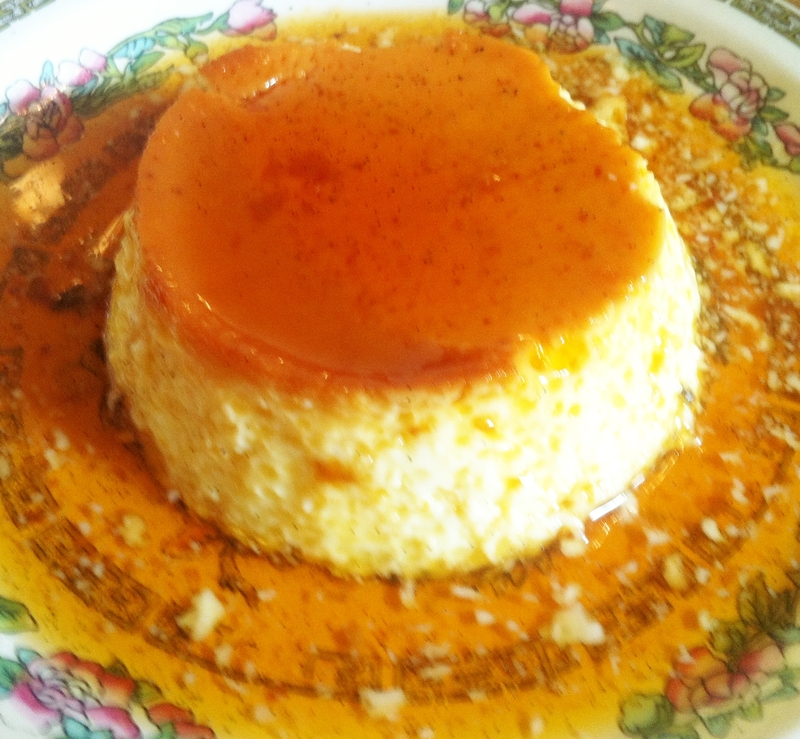 The creme caramel tasted of ‘egg’ and had a lumpy texture, not very pleasant at all. The caramel sauce however was sweet had a tint of orange taste through it. The chocolate brownie cake was not any better. 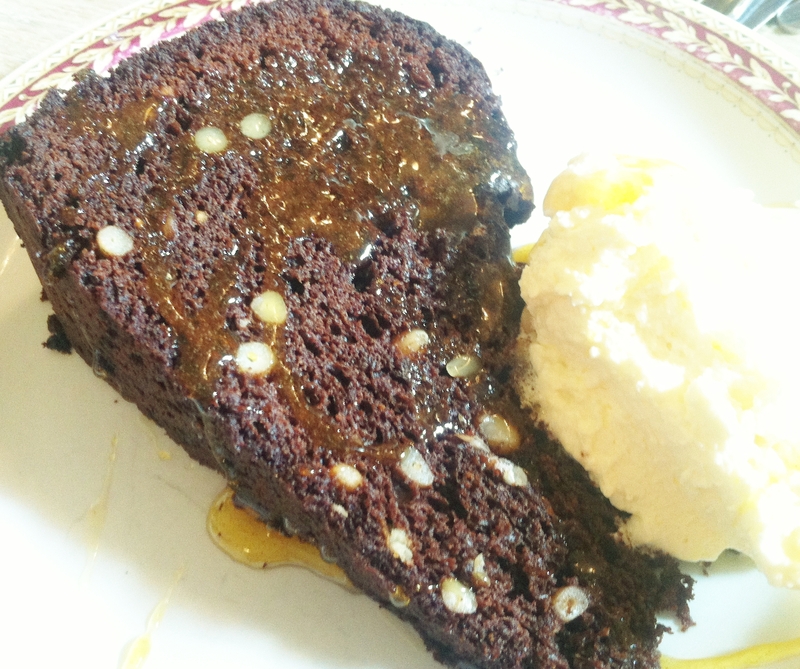 Very hard, dense chocolate cake. The ginger caramel was almost non-existent. It was a good job we had the caramel sauce from the crème caramel to add some moisture to the cake. We settled the bill. Overall we were all disappointed. Yes it is an affordable, no frills or fuss restaurant. However it is affordable for a reason. The lunch portions are very tasty but very small. The desserts are a let-down and the atmosphere is more shabby than chic.